George Wythe (1726 – June 8, 1806) was a lawyer, a judge, a prominent law professor, and a signer of the United States Declaration of Independence. He was the first professor of law in America, earning him the title of "The Father of American Jurisprudence." Wythe served as a representative of Virginia and a delegate to the Constitutional Convention. He overcame the odds of poverty by engaging himself into whatever education he could manage. Wythe, influenced by an education rooted in classical tradition, contributed in the areas of law, politics, and education. He was a greatly renowned American law teacher, whose students included Thomas Jefferson, John Marshall, and Henry Clay. Wythe was born in Elizabeth City County, Virginia, and educated at home by his mother. His father died when he was three. Wythe attended the College of William and Mary but dropped out, unable to afford the fees. He read law at the office of Stephen Dewey and was admitted to the bar in Spotsylvania County, Virginia in 1746. He was Clerk of the committee on Privileges and Elections of the House of Burgesses in 1746, and was appointed Attorney General by the Royal Governor of Virginia in 1773. He served in the House of Burgesses until its dissolution. In 1747, Wythe married Ann Lewis, but she died the following year. In 1755, his brother died and he inherited the family estate. However, Wythe married Elizabeth Taliaferro the same year and decided to live in Williamsburg in a house that his new father-in-law, an architect, designed and built for him and his wife. Their only child died in infancy. Wythe served as mayor of Williamsburg, Virginia from 1768 to 1769. In 1779, he was appointed to the newly created Chair of Law at the College of William and Mary, becoming the first law professor in the United States. Wythe's pupils at William and Mary included Thomas Jefferson, Henry Clay, James Monroe, and John Marshall. Of these men, Wythe was closest to Thomas Jefferson—so close that Jefferson once described Wythe as a "second father." At a time when law students often read law for a year or less, Jefferson spent five years reading law with George Wythe, and the two men together read all sorts of other material; from English literary works, to political philosophy, to the ancient classics. 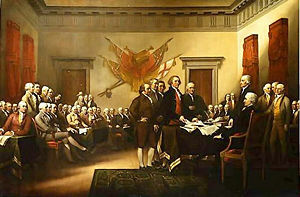 In John Trumbull's famous painting, The Declaration of Independence, Wythe is shown in profile farthest to the viewer's left. Trumbull's painting can also be found on the back of the U.S. $2 bill, but Wythe's image is cut off in that depiction..
Wythe taught for twenty years and loved having an effect on young minds. From a man, entrusted with such high concerns, and whose time was occupied by so many difficult and perplexing avocations, it could scarcely have been expected, that he should have employed a part of it in the toilsome and generally unpleasant task of the education of youth. Yet, even to this, he was prompted by his genuine patriotism and philanthropy, which induced him for many years to take great delight in educating such young persons as showed an inclination for improvement. Harassed as he was with business, and enveloped with papers belonging to intricate suits in chancery, he yet found time to keep a private school for the instruction of a few scholars, always with very little compensation, and of ten demanding none. Several living ornaments of their country received their greatest lights from his sublime example and instruction. Such was the upright and venerable Wythe. Wythe was elected to the Continental Congress in 1775, voting in favor of the resolution for independence and signing the Declaration of Independence. He helped form the new government of Virginia and was elected Speaker of the Virginia House of Delegates in 1777. In 1787, Wythe attended the Constitutional Convention playing an insignificant role, leaving the proceedings early, and not signing the final version of the Constitution. However, the next year, he was one of the Federalist leaders at the Virginia ratifying convention. He presided over the Committee of the Whole and offered the resolution for ratification. In 1789, he became Judge of the Chancery Court of Virginia and later designed the seal of Virginia inscribed with the motto "Sic Semper Tyrannis," which is still in use today. A slaveholder, Wythe became an abolitionist, freeing his slaves and providing for their support. Wythe provided for his slaves, Lydia Broadnax and her son, Michael Brown, in his will. The will also contained a provision for Brown's education. According to Jefferson biographer Fawn Brodie, Broadnax was almost certainly Wythe's concubine, and Brown was his son. Wythe's other heir, his great-nephew, George Wythe Sweney, decided to avoid this dilution of his fortune by poisoning the slaves with arsenic. In the process, he accidentally killed Wythe as well, though Wythe lingered long enough to change his will to eliminate his bequest to his murderer. Broadnax survived the poisoning. It was the only punishment his killer received. Sweney was acquitted of murder in Virginia, primarily because of a law that forbade the testimony of black witnesses. Sweney was tried for forgery, and convicted, but that was overturned on appeal and Sweney is said to have gone to Tennessee, stolen a horse, and served a term in a penitentiary. The rest of his life was then lost to history. Wythe, in his will, left his extraordinary book collection to Thomas Jefferson who described his mentor and friend by stating: "He was my ancient master, my earliest and best friend, and to him I am indebted for first impressions which have [been] the most salutary on the course of my life." As "The Father of American Jurisprudence" Wythe's legacy lives on within the American system of justice. It also included contributed to the shaping of the new republic through the lives of his famous pupils, including Thomas Jefferson, John Marshall, and Henry Clay. Wythe's home in Williamsburg, Virginia, has survived to the present day. It was acquired by the Colonial Williamsburg Foundation in 2006, and is preserved as a museum. Wythe County, Virginia, its county seat Wytheville, Virginia, George Wythe High School (also in Wytheville, Virginia), George Wythe High School in Richmond, Virginia, George Wythe Elementary in Hampton, Virginia (present day name of Elizabeth City County), and George Wythe College (Cedar City, Utah) are also named after George Wythe. The Marshall-Wythe School of Law at the College of William and Mary in Williamsburg, Virginia, also bears his name. ↑ American Revolution, Key to Trumbull's Picture. Retrieved December 13, 2007. ↑ Rev. Charles A. Goodrich, Lives of the Signers to the Declaration of Independence (New York: William Reed & Co., 1856). ↑ U.S. Constitution, Notes on the Constitution. Retrieved December 14, 2007.